Medium off white head dies quickly leaving a medium or less lacing above a clear amber colored beer. Mild Aroma of an almost sweet caramel malt with a light nutty edge to it. Taste is pretty similar to the aroma with its sweet caramel and nutty grain malts, maybe a bit more sweet than the aroma. A slight bitter drying aftertaste on the light medium to medium bodied beer. The slight bittering effect of the aftertaste is just enough to make you want to take another drink. Pours a solid, somewhat opaque brown, with a thin wispy tan head. Nice roasted malt, sweet toffee smells. Taste was malty and sweet, better than expected, lacked any sort of nutty fullness. Slightly thin and watery feel and finish. If they fix that, I think they have a very good beer. Not as good as the ol Abita Turbo Dog, but better than I expected. For the bashing Pete's takes here, I think their beers are just slighty away from being really good. But then again, they probably used to be good, and recently watered them down. A: Pours a dark amber with a thin fizzy white head, solid retention, no lace. S: Light malt, with some interesting notes of cherries, not a standout by any means, but I quite like it. T: Some crystal malt sweetness with a mild bite of hops at the finish. Minor secondary ale fruitiness. M: Frothy, fizzy, thin body, no real structure. Overcarbonated at times. D: A step up from the macros, but nothing more. I was glad to try this before it went the way of the dodo, but this will be my last experience with Pete's I believe. Appearance: Pours a clear deep copper red with a lavish off-white head, which gradually settles to a quarter inch layer with coarse foam. The head is renewed by streams of slow-rising carbonation. The lacing is broken, but quite thick. Aroma: Fruity aroma with hints of caramel and grassy hops. Taste: Very nice flavor, slightly sweet and quite complex, begins with fruit and hops, toasted malts, and nuts. Hop notes rise smoothly from the beginning to a burst at the finish. The mild hop bitterness lingers on well past the end of the taste. Mouth feel: Pleasantly full with a tingle of carbonation on the tip of the tongue. Drinkability/notes: Not the finest brown ale, but certainly quite pleasant, worth a try. Presentation: Packaged in a twelve ounce brown glass longneck, with a pry-off cap. Served in a standard pint tap glass. T: The cherry note in the nose is quite apparent. It is the flavor of candied cherries, which also gives the brew a very sweet flavor. The balance is definitely compromised by the sweet malts and fruits, however I do not mind at all, however the sweetness of this beer is very overwhelming...brace yourself!! Poured a nice brown/copper color with head that didn't last. Tasted of sweet malts, with a slight hint of fruity esters. Very satisfying. Not great, but pretty good brown ale. I'll probably drink it again because its pretty easy to find. 12 ounce bottle into favorite goblet. I remember when this beer came out and thinking how I was expanding my horizons when it started being carried in my local liquor store. It doesn't taste at all like I remember. 3 finger head that goes away 'cept for a bit of a collar. Canned mushrooms is all I can say for the rest of the review, although that is not necessarily a bad thing. This is an OK beer. But too much of the canned mushrooms and bitter aftertaste like a metal can. Peter need to chock the wheels of this brew that will mellow out the back roll of that mushroom metal can bitterness or completely stop it. The mouthfeel is big carbonation but not bad. Yeah Pete doesn't seem to be the horizon expanding beer it once was to me. Maroon color with creamy white head. Smells of roasted malt. This is a good brown, has nice coffee-roasted malt flavor, and not a lot of hops backing, which is the only thing I can think of wrong with this beer. Not bad, overall, I'd gladly drink one of these any time. A- pours a mostly clear coppery brown with a decent lived somewhat creamy beige head. some drippy lace reminiscent of the swooping flourishes of the "wicked" font stick to the glass, but it's really nothing special. S- metallic, buttery, and earthy. brown sugar, sandalwood, butterscotch, and mineral water with dark cookies. as it warms a bit the aroma of very fresh toasted barley comes out and earns another point for the wicked one. cthulhu. T- sweet and sugary, but not over the top. hops switch it to glide half way through with a very soft bitterness, just in time to check the malty sweetness. toasty, grainy, earthy and nicely balanced. finishes with mild leafy hop flavor. MF- tight medium carbonation kinda controls the starship for the rest of the feel. not so syrupy at all, this is a lighter bodied and pleasant brown. D- not being too sweet and having a drier body help this one fare better with me. much better than average. Pours brown with a thin white head. Brown color and a faint roasted malt aroma. A hollow taste that seems to be missing something. Again, finish leaves you hanging just a little. I recall this beer as being much better. In fact, Petes is one of the beers that got me into homebrewing in the early 1990s. At this point, its worth a try, but not much more. Old Pete's Wicked has been around for awhile, but I finally got around to trying it. It poured a reddish amber color and formed a nice white head that subsided quickly and left little lace. The aroma was lightly of malt and caramel. The flavor was of malt, caramel, citrus. The finish was a bit tangy yet bitter. Overall, a fairly average beer. It's still better than the big guns, but I really expected more from it. Pours a clear, red copper with a fairly nice head. Light cream; disappears quickly. Little to no lacing. Smells of malt, sugars, and perhaps a hint of hops. This carries on into the taste; very simple malt with a some earthy notes and maybe a some metallic phenols. Decent mouthfeel; not watery, but leaves much to be desired in terms of texture. Overall a decently drinkable beer, though not much character really. When poured the color of this brown ale showed a medium, clear, transparent brown that just didn't look right. Also there was no foam or lace when poured in the glass. The taste was sort of a sweet/tart feel in the mouth. More sweet than tart. Easy drinking, this ale is a summer quincher. Not the best, but by far, not the worst. Not even close to the worst! This is a great American Brown. I am most impressed with the drinkability of this beer, it is very smooth. The aroma and taste are other great qualities, as stated in previous reviews (The aromatic hops, in my opinion, are great in this beer). Not only that, but you can reuse the bottles for home brewing! I don't think this brewery believes in hops... that or it favors a very mild variety. This offering is decent, however...a clear brown color with a fading head, but a bit of lace remaining. Smell is big on malt with a bit of nutty, organic aroma...taste is again, chewy, sweet malt with a marshamallow/nut flavor. Just a hint of roastiness, but the finish bothered me. Midway through this has body, but the finish is a little watery. The trend I'm noticing here of minimal hopping leads me to think I won't be buying any more Pete's products, but that's personal preference. Pours a brownish/ruby color (just as promised on the label), although it's not as deep brown as most brown ales; it does have a bit of head and some lacing, just not tons of either. Nice malty, earthy scent, although it is not as strong as I'd like. Excellent taste, deep and earthy, very malty, and it does have an excellent nuttish flavor. It goes down quite smooth. I'm sorry I've waited so long to try it. 1) I wish I knew then, what I know now. I distinctly recall a severe dislike for the taste of Pete's Wicked Ale back in the days of my mis-spent youth. I also had a severe dislike for Sierra Nevada Pale Ale back then, as well. Today, I find SNPA a very enjoyable beer--Pete's, I do not! This is regrettable, since, what I recall as a tongue-wincing hop moster at one time, would probably be in my short list of "go-to" macro-micros now (those that pinch hit for the big beers during a shopping crisis). But, Pete's, from what I've read, has long since lost its title as a respectable micro. The pour almost fooled me with its rather deep amber hue, and tan, dimpled head, almost as though I could expect some flavor from the beer. That came to a screeching halt at the first whiff, which, along with the taste, exuded that fusel-spoutin', crystal-cheatin', hangover-laden, "Alcohol-Death-by-Anhauser-Busch" smell, that is only surpassed in repulsiveness by.....Anhauser-Busch. This was a tough one to choke down, and squeeking out any flavor whatsoever came as a tedious chore. Hops? There aren't any, as far as I can tell. But what do I know, with a case of Lagunitas, Bear Republic, Stone, Marin, and Moylan's bombers sitting in the basement? PS - They would do well to rename this beer, "Pete's Limpid Ale." Pete's was one of the fancy beers when we were in college. Gave it another try now that I'm more "sophisticated". Appearance was coppery with a medium/thin head. The smell was kind of nice, little bit malty, little bit hoppy. I like the taste as it's nice and basic. Mouthfeel was medium as was the drinkability. Good go-to brew for rookies but not so exciting. Pete's "Wicked Ale" Pours A wonderful dark amber from a 12oz dark brown glass bottle. Nose is not much of anything at all... just wet and kind of damp. Taste is a slight sweet malt and some... just some bitter hops. not a lot going on here with the nose or the mouth. On the other hand, the carbonation goes hand in hand with the alcohol and delivers a most welcome buzz!!! Bottom line? 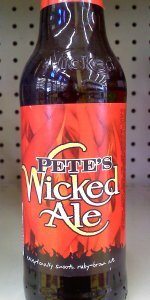 I will be drinking Pete's "Wicked Ale" again when I am looking for something light and refreshing! I just purchased this beer for the first time this week. It has a nice brown color to it with an inviting smell. I really enjoyed the taste of this ale it was good tasting without being too bold. There is a little light on carbonation than average but its still very drinkable. For a person that enjoys ales I would definitaly suggest this ale. Ruby red colored with an impressive lasting head. Sweet malty aroma. Kind of tasted like a Scottish Ale as far as the satisfying malty flavor goes. This did have a definite hops counter to the malt about halfway through and to the end. This was not bad at all. the coloring of this beer is a deep reddish brown with an off-white head that will die before you even get it to the table from the bar. it will leave small traces of lace behing, but overall the appearance is not so good. it has a rich aroma of sweet malts and fruits. flavoring is packed with sweet malts and fruit flavors. it is very sweet with a hint of caramel. it had a medium body with a crisp carbonation at the start. hops come in lightly at the end, but are not really doing much. i guess it is just one of those beers that you can get at a bar with a poor selection.